Foot reflexology… foot acupressure… foot massage… what’s the difference? The key difference for me is the fact that acupuncture involves those tiny needles placed at key pressure points in the body, but with acupressure you just use your fingers or hands instead. Here are some of the key areas of the foot to concentrate on when you’re looking for acupressure spots to relieve a variety of ailments. Plus, pressure points in other parts of the body that might be helpful, as well. Here’s how to do a reflexology foot massage (on yourself or someone else). Notice that you can choose to concentrate on the foot and ankle in general or focus on specific pressure points. Each yields different results. The good news is… for most healthy individuals, a 5-minute foot rub (per foot) can be performed daily without any problem. So acupressure of the feet appears to be one of the safest ways to help yourself. 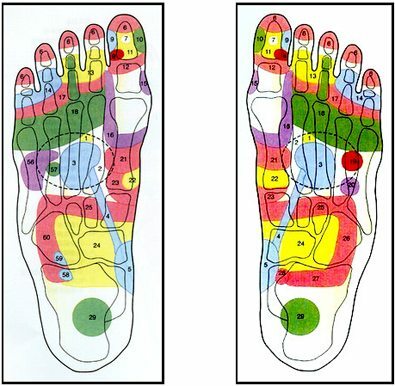 This is a thumbnail of Matthew Scott’s awesome Foot Reflexology Chart (.pdf). Click the photo to see an explanation of each pressure point in the foot and see which part of the body those pressure points affect. Here are a few other Foot Pressure Point charts where you can see the pressure points in the foot from a side view, an inside view, and a view looking down at the foot. Check out this do-it-yourself guide for finding the acupressure point you need to get a reaction in a particular part of your body. Here’s a reference guide for knowing when to apply pressure to certain parts of your body, based on what you are currently experiencing in life. The beginner’s guide to acupressure helps you determine which pressure points to concentrate on when. This is one that I use a lot… it’s a spot on the hands that helps to relieve neck pain (like from spending too much time at the computer).